Chilli rating - mild -1. Suitable for vegetarians. 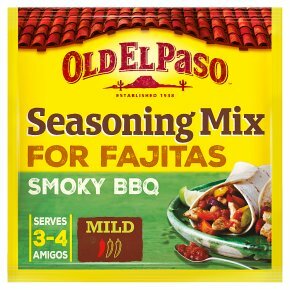 Old El Paso Seasoning Mixes are the perfect addition to your meat or vegetables to create the ultimate Mexican meal Old El Paso Seasoning Mixes are quick and easy to use- great for making your Mexican Fajitas or Tacos burst with flavour Try our great range of Old El Paso Seasoning Mixes for Fajitas- Smoky BBQ, Crispy Chicken, Garlic and Paprika or Chili! Since 1938 we've been bringing vibrant flavours from the streets of Mexico. Our Seasoning Mix for Smoky BBQ Fajitas has a unique blend of cayenne pepper, garlic and ginger. All you have to do is add the chicken, crunchy peppers, an onion and sizzle away. Once cooked simply wrap up in a warm tortilla and add our Old El Paso? Thick 'n' Chunky Salsa. Let the Mexican Fiesta begin! For use only in food that is cooked after adding the seasoning mix.